Many people refer to "tasks" as "problems". This can make the tasks seem more important and the colleague who solves the "problem" gains kudos, but this linguistic inflation fogs the real situation. The requirement, i.e. the situation as it should be. The path between A and B. This is the solution. You have merely a "task" if your path between A and B is known. A "problem" is when you don't know how to get from A to B. Most of these steps profit from you writing things down - whether on a flip-chart, a sheet of paper or typing it into some sort of software. Define your terms, i.e. ensure that you and others are absolutely clear about where you are and where you want to go. This fog-clearing frequently produces a clearer picture of your real situation, and might show you the way forward, so your "problem" collapses to a "task". Your problem was actually that you hadn't defined the situation clearly enough. "Divide and conquer" worked for the Romans, and probably will for you, too. Analyse your problem, writing down any aspects you can think of. Clear away the parts of the problem which you know how to solve (these are by definition merely tasks) and what you have left is the real problem. Getting this far is often nine-tenths of the way to the solution. Defining the problem in this way makes it clear. It's easier to pick up a ball than a patch of mist. Thinking about and/or discussing the above steps will often help you to find a way forward to solving the real problem. Or it can allow you to formulate a concrete question which you can then put to a colleague, pose in an internet forum, or simply enter into a search-engine. Knowing the right person to ask is a big help, but you have to know the right question first, so you can judge who is the right person to ask it. How can i2Brain help you to solve problems? A flip-chart is a useful tool, but a computer running i2Brain and a projector is far more powerful. Everybody present can see the state of play. Brainstorming sessions using a flip-chart always become messy, or you start wishing you could move your blobs around on the paper, or temporarily delete a few points so you can concentrate on others. You can do all of these things (and more) with i2Brain. You type each point into a box (item) on the screen. Where you find that there is more than one step, you divide it into two or more items. 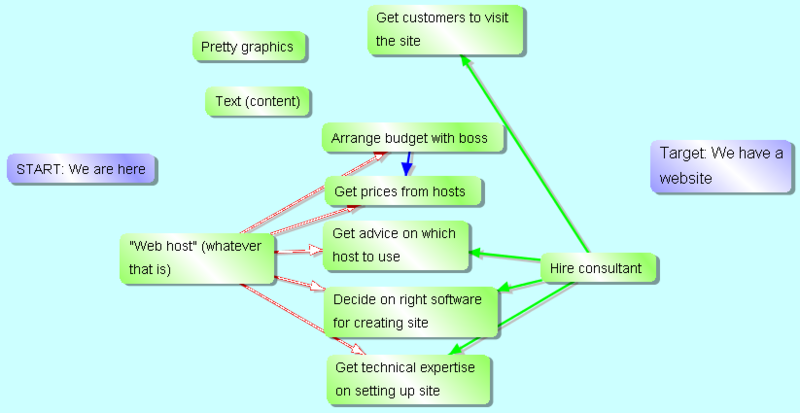 You join activities which are in some way connected using arrows. You might want to define an "aspect" (which is really a new "dimension") called "Type" so that activities you know how to carry out get the value "Task" whereas the parts which are still a problem get the value "Problem". You hide the "Tasks" with just two clicks, allowing you to concentrate on your problem. Managers might find that some of their younger and less experienced coworkers are simply scared of tackling certain tasks. Giving them this recipe for solving problems will make them more productive, creative, motivated and happy. The Tasks are doable. Either the texts already exist in various brochures etc. in the office, or the author just needs to be given the job of adapting the texts for the website. Similarly, graphics or a graphics artist are already available. To make the diagram more comprehensible (which is, after all, our reason for visualizing anything in the first place) we can colour the items according to their Type. 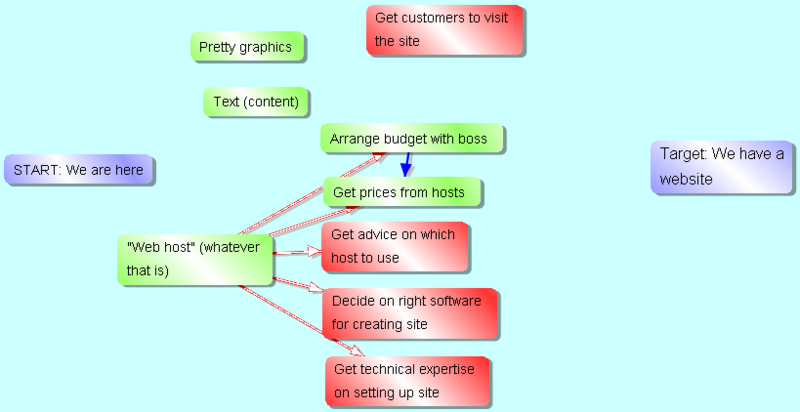 The brainstormers know enough about web sites to be able to write "Web host (whatever that is)". This, they decide, is a problem, because they don't know enough about it to write down the doable tasks. Some of these smaller units are still problems, so you decide to get a consultant in. And voila - no more problems. (This last sentence was sponsored by the Amalgamated Union of Consultants, Advisers and Sundry Luminaries.) The point here is that you know what you have to ask her. She won't have to produce any graphics or text, just solve those last few more technical problems. You have solved the "Problem" that your company doesn't have a website.